Neotropical forests are known to harbor tremendous biodiversity. Fungal diversity in neotropical forests is also high but plant-mutualistic ectomycorrhizal (EM) fungi are widely thought to be underrepresented. In contrast to temperate and boreal forests where EM fungi are generally ubiquitous and may represent up to 40% of total macrofungal diversity, lowland neotropical EM fungi appear to be restricted to a narrow range of woody host plants characterized by regionally-restricted, high-density distributions or highly dispersed, low-density distributions in rainforests otherwise composed of non-ectomycorrhizal trees. These factors, combined with limited sampling effort, have resulted in a paucity of information concerning the distribution and diversity levels of EM fungi and plants in the lowland neotropics, preventing a full evaluation of the organisms involved in this important symbiosis in the most biodiverse terrestrial region on Earth. This project aims to document the diversity of EM fungi associated with a broad range of host plants at a variety of spatial scales in the central Guiana Shield (Guyana) of northeastern South America, a neotropical region with a relatively high concentration of EM associations. This project will combine traditional macrofungal sporocarp surveys with molecular ecology methods that detect mycorrhizal fungi based on DNA sequences from roots of a broad spectrum of host plant taxa in monodominant and tree-diverse rainforests. 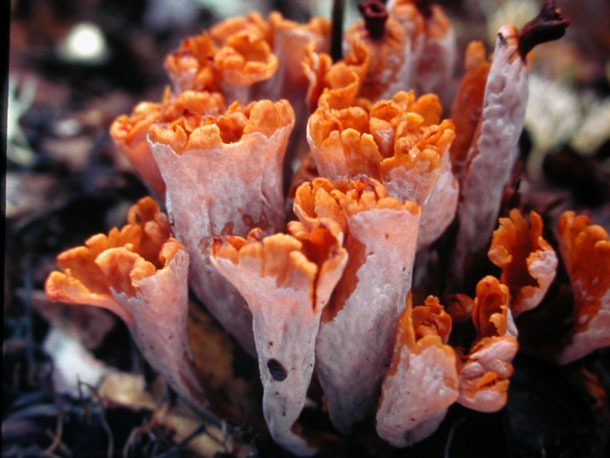 Specific objectives are to: (1) coordinate and conduct sporocarp inventories of all known groups of EM fungi, including epigeous (above-ground), resupinate (crustose), and hypogeous (below-ground or ‘truffle’) species, (2) employ molecular-based methods to document the EM fungal diversity on roots of host plants in the Nyctaginaceae, Polygonaceae, Gnetaceae, Dipterocarpaceae, Ericaceae, and Fabaceae, and (3) systematically sample EM roots of the monodominant tree Dicymbe corymbosa in established study plots to determine the full spectrum of EM fungal diversity. This study will provide the most complete documentation to date of EM fungal diversity in neotropical forests.